Located just 80km east of Vancouver, Chilliwack River is the most popular recreational fishing stream in British Columbia due to its productivity. Both local and visiting anglers can enjoy quality salmon and steelhead fishing due to Chilliwack salmon hatchery's production. It is a love and hate relationship between anglers and this river. While fishing can be fantastic, it also generates some unwanted consequences. The fall salmon fishing season brings out thousands of anglers to Chilliwack River, creating crowding and sometimes unpleasant situations. While fishing pressure can be quite heavy, unexplored spots are available most of the time. With some exploring, a good experience on the Vedder is almost guaranteed. From Vancouver, travel east on Highway One to Chilliwack. Three exists take you to the river, they are No. 3 Road, Lickman Road and Vedder Road. The river can be broken into three sections. The lower river, from the Vedder Crossing Bridge to the canal, has many access points. The most commonly spots for access include Keith Wilson Bridge, Lickman Road, Peach Road, Bergman Road and the Vedder Crossing. The mid section is bounded by the Tamahi Bridge and Vedder Crossing, while the upper section runs from Tamahi Bridge to the upper fishing boundary just downstream from Slesse Creek. Chilliwack Lake Road runs along both sections and various trails lead to the river. While vehicle access to the river is plentiful, it is best to avoid fishing at these spots. Park your park, walk and explore. Chilliwack River is long and unoccupied spots are in fact readily available if one ventures away from vehicle access points. Fishing opportunities are available on Chilliwack River throughout the year except the month of June. In July and August, red chinook salmon fishing is available. This is a small transplanted stock that is raised by the Chilliwack hatchery. During this two months, trout fishing is also available, however most of the rainbow trout encountered are juvenile steelhead so need to be released with care. Cutthroat trout fishing often improves in the lower section of the river in August. September and October are usually the best fishing months. White chinook salmon up to 30lb, coho salmon, pink salmon (during odd years) and chum salmon return in large numbers. The fall salmon fishing extends to November and tapers off in December. From December to May, experienced anglers look for steelhead, the most sought after freshwater gamefish, in Chilliwack River. Fishing is challenging from December to early February, but improves greatly in March and April. In May, the river has sectional closure and remaining opening areas are restricted to flyfishing only. For salmon and steelhead fishing, the most commonly used fishing technique is float fishing with various bait such as roe, single eggs, ghost shrimp and artificial bait. Casting artificial lures can also be deadly when fishing pools and deep runs that have moderate to weak river current. A 1/4 to 3/8oz spoon fluttered across a tailout almost never fails to trick a coho salmon, while spinner blade fished under a float is productive for all species. Flyfishing is more commonly practiced in the lower section of the river where the terrain is more suitable. The best months for flyfishing are August, September, November, April and May when water level is low. If targeting large species is not your cup of tea, then exploring with a small spinning rod can usually yield some trout, whitefish, northern pikeminnow and sucker. Try float fishing with small bait items such as dew worm, single eggs or casting small lures. You must have a valid British Columbia freshwater fishing license. If you intend to retain salmon, then you must also purchase the freshwater salmon conservation surcharge. If you intend to fish for steelhead, then you must also purchase the steelhead conservation surcharge. 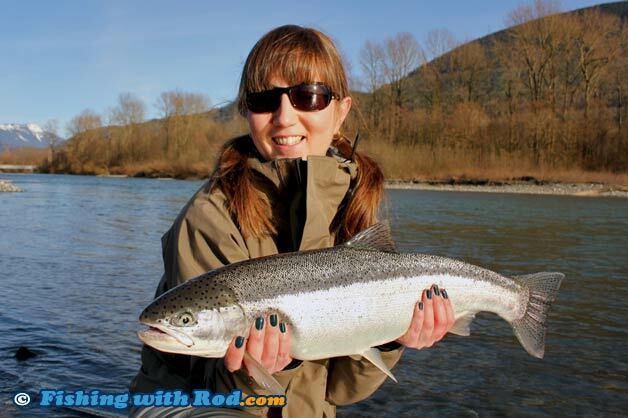 Chilliwack River is located in Region 2 in the British Columbia freshwater fishing regulations. Intentionally snagging fish is illegal! If you keep your float depth too long and allow fish to snag themselves when retrieving your line, then you are snagging fish. If fishery officers observe you continuously catching fish by snagging, you will be fined. If you are releasing a fish, please make sure the fish remain in the water at all times. Do not drag your fish onto the river bank and kick it back after unhooking it. Identify your fish before you decide to kill it. Wild coho, steelhead and trout have to be released. If you cannot identify it, please release it. If you decide to keep a fish, please kill it immediately. Keeping fish alive in a pool of water or tying it onto a rope and letting it swim in the river is illegal. Respect other anglers' space! If a spot is already taken, find a different spot instead of crowding the same area. You can make everyone's fishing experience enjoyable by spreading out. Please do not litter. Pick up your own garbage as well as others' on the river bank so we can still enjoy this fantastic fishing stream in the future. Respect private properties by not trespassing. Keep your noise down early in the morning when walking by private properties.